We wanted a military metaphor for marketing, but I didn't want it to be reminiscent of a real war from any era. So I drew tanks from different countries and colored them in ridiculous shades. Same with the jets. 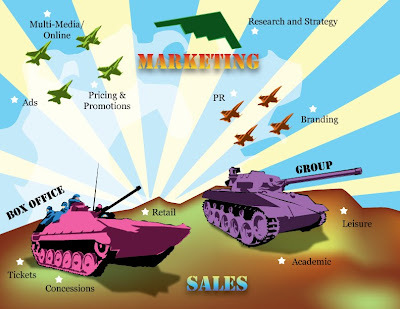 The idea is that Marketing is to Sales what Air Support is to Ground Forces. It's a commonly used way to describe the relationship between the two. So, I used it for our org chart. 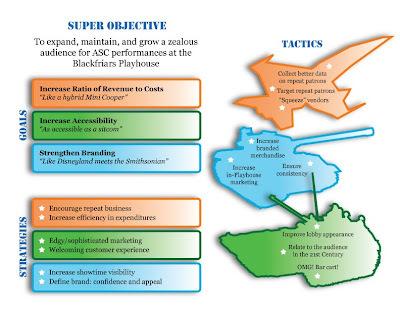 Then the Goals, Strategies, and Tactics page echoes the military thing, but it's color-coded and uses short launch ideas rather than explain everything. These were used as visual aids in a staff meeting at the American Shakespeare Center.